The 12 Week Online Team Training Program creates continuity, responsibility and accountability for your team. 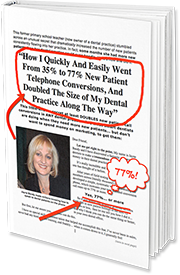 The Dental Phone Excellence Training Program helps you do what you struggle to find time to do and just don’t have the skills needed to help your team. In between each Team Training call, your team will implement the patient communication skills and get results at the same time. Your team will track patient numbers including New Patients Calls, Call Conversions and Cancellations. Measuring your team’s success is very important. All of your New Patient Calls will be tracked and evaluated to ensure your team’s Online Training is focused on what is needed to get the right results. You will now know exactly what your team are productively doing for your practice and what they need to focus on to get better results for the practice and your patients. At the end of the Team Training Program you will have an excellent Patient Communication resource from each training call that can be used as part of your ongoing team training. An extension of this Training Program is offered at the end of the training on request. Many clients choose to continue with one Team Training Call per month to continue the team accountability and responsibility and consistent results. If you’re interested in learning more about what Dental Phone Excellence can do for your dental practice, Jayne would love to hear from you. Contact Jayne today to get started—she can’t wait to speak with you and help you to transform your practice.